Jeep has revealed pricing for the new Renegade SUV, with the range starting at £16,995 and going up to £27,995. It goes on sale 6 January 2015 in the UK, with the first cars hitting the road the following month. The Renegade comes with a breadth of engines ranging from a 1.6-litre eTorq petrol with 110PS, through a 120PS 1.6-litre MJet diesel, a 140PS 1.4-litre turbo petrol, a 2.0-litre diesel also with 140PS, and a more powerful 170PS version of the same unit. Trim levels begin at Sport, go on to Longitude, then Limited, and finish at Trailhawk. There’s an Opening Edition too, limited to 200 cars and available from launch. 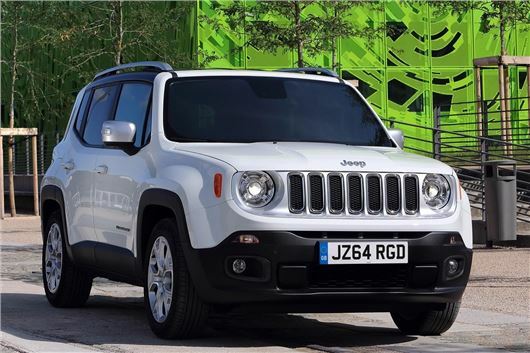 In order for the Renegade to compete with the relatively crowded mid-size SUV crossover market, standard kit list is fairly comprehensive, including DAB, air conditioning, 16-inch alloy wheels, and remote central locking. Further up the range, Longitude adds 17-inch alloys, a better stereo, body coloured door mirrors and handles, cruise control and front fogs. Limited makes the wheels an inch bigger still and adds heated seats, leather upholstery, tinted windows and rear parking sensors. The Opening Edition comes in orange or white with a black roof, and sitting on 18-inch alloys. Trailhawk, finally, is the rugged end of the Renegade spectrum – for the ill behavior off road, you might say – incorporating skid plates, unique bumpers, raised ride height, and a low ratio mode for the automatic gearbox. Every version of the Renegade is four-wheel drive, utilising a system that "switches seamlessly" between front-wheel drive and four-wheel drive as necessary, while Jeep parent company Fiat has bestowed the Renegade with the segment’s first nine-speed automatic gearbox. Well £16995 isn't a bad entry level price for a petrol 4x4 is it? only the Jimney and the 4WD versions of the Panda come beneath the Renegade. OK the Dacia Duster also comes in under the Jeep's price but is not as well equipped nor does it have the kudos of the Jeep badge. Is a front wheel drive version also in the offing as well? Not bad but I'd rather have the Fiat 500X. I believe it's based on the same Jeep Renegade platform.